New structural insights into anomeric carbohydrate recognition by frutalin: an a-D-galactose-binding lectin from breadfruit seeds. VIEIRA NETO, Antonio Eufrásio; SOUSA, Felipe Domingos de; PEREIRA, Humberto D'Muniz; MORENO, Frederico Bruno Mendes Batista; LOURENZONI, Marcos Roberto; GRANGEIRO, Thalles Barbosa; MOREIRA, Ana Cristina de Oliveira Monteiro; MOREIRA, Renato de Azevedo. Abstract: Frutalin (FTL) is a multiple-binding lectin belonging to the jacalin-related lectin (JRL) family and derived from Artocarpus incisa (breadfruit) seeds. This lectin specifically recognizes and binds a-d-galactose. FTL has been successfully used in immunobiological research for the recognition of cancer-associated oligosaccharides. However, the molecular bases by which FTL promotes these specific activities remain poorly understood. Here, we report the whole 3D structure of FTL for the first time, as determined by X-ray crystallography. The obtained crystals diffracted to 1.81 Å (Apo-frutalin) and 1.65 Å (frutalin-d-Gal complex) of resolution. The lectin exhibits post-translational cleavage yielding an a- (133 amino acids) and ß-chain (20 amino acids), presenting a homotetramer when in solution, with a typical JRL ß-prism. The ß-prism was composed of three 4-stranded ß-sheets forming three antiparallel Greek key motifs. The carbohydrate-binding site (CBS) involved the N-terminus of the a-chain and was formed by four key residues: Gly25, Tyr146, Trp147 and Asp149. 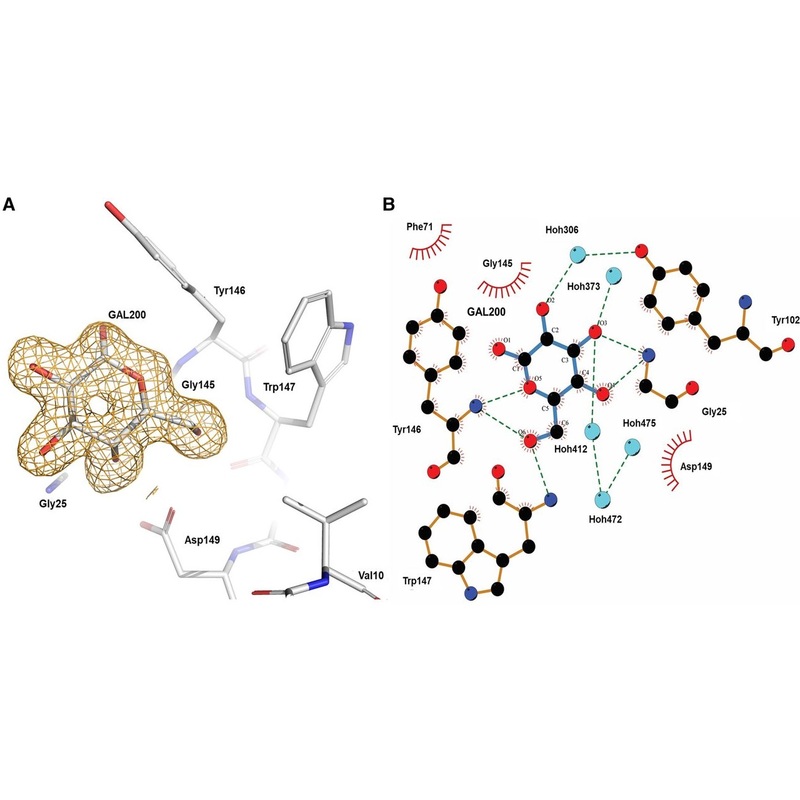 Together, these results were used in molecular dynamics simulations in aqueous solutions to shed light on the molecular basis of FTL-ligand binding. The simulations suggest that Thr-Ser-Ser-Asn (TSSN) peptide excision reduces the rigidity of the FTL CBS, increasing the number of interactions with ligands and resulting in multiple-binding sites and anomeric recognition of a-d-galactose sugar moieties. Our findings provide a new perspective to further elucidate the versatility of FTL in many biological activities.